Singer. Composer. Guitarist. Producer. Curator. Mom. These are some of the words that Toshi Reagon uses to describe herself, but there are so many more that can be added to that list to reflect the astonishing scale of her creativity and influence: innovator, visionary, activist, and more. Reagon is bringing her multi-faceted approach to social consciousness and community engagement to her role as Carolina Performing Arts’ first Mellon DisTIL Fellow. She will begin her work within the frame of her opera adaptation of Octavia E. Butler’s novel Parable of the Sower. The work developed by Reagon and her mother–scholar, singer, activist and Sweet Honey in the Rock founder Bernice Johnson Reagon–will have its US premiere in Chapel Hill this November. The novel explores the struggles related to race, gender, and resource inequality in a dystopian vision of America wrecked by environmental disaster and political mismanagement. “The book encompasses so many systemic issues in society and communities that I thought it would be a rich foundation on which to launch this residency and fellowship,” says Reagon. She says that it’s an honor to be asked to be in the realm of academia. “I’m particularly happy to be at UNC and in the Triangle,” says the Brooklyn-based artist. “This is a wonderful, deeply caring community that really knows who they are, what they are, what they should be, what should be held, and what should be released. To have the opportunity to be in dialogue with such an incredible group of people with diverse and clear voices warms my heart and makes me want to be a brilliant contributor. Starting on Friday, April 12, Toshi Reagon will host a festival marking the culmination of her work as a Discovery through Iterative Learning (DisTIL) fellow at Carolina Performing Arts, supported by the Andrew W. Mellon Foundation. Since being named CPA’s inaugural DisTIL fellow in 2017, Reagon has worked with UNC faculty and other area collaborators on projects that go beyond performance. Reagon has focused on the issues and conditions explored in Octavia E. Butler’s novels Parable of the Sower and Parable of the Talents, which delineate a bleak future caused by humans’ ongoing actions against one another and the earth. Through class visits, artistic presentations, and conversations, Reagon and her collaborators have brought forth possibilities for positive change. Reagon and her collaborators offer several events open to the public, so that all can participate in this forward-looking vision. This exploration began for Reagon in 1997 with her mother, Bernice Johnson Reagon, when they first sang songs with Parable of the Sower for a Princeton University class they co-taught at Toni Morrison’s invitation. 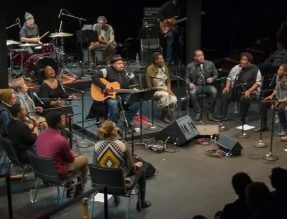 Those songs became the backbone of the opera Parable of the Sower (created by Toshi Reagon and Bernice Johnson Reagon, directed by Eric Ting) which premiered at Carolina Performing Arts in 2017, at the beginning of Reagon’s second DisTIL fellowship year. Using these novels as a guide and her own opera as an anchor, Reagon has explored with faculty, as well as students, community leaders, and local activists and artists, issues highlighted in Butler’s stories that likewise affect the Triangle today: divestment from community, harmful government practices, environmental negligence, untempered interpersonal violence. Reagon found that each of her collaborators held deep knowledge that could alleviate one of these urgent social, political, or environmental issue in our midst, and she has worked with them to create a “map,” much like those created by Butler’s protagonist Lauren Olamina, that can guide us away from the perilous state that Butler warns will come if we do not take action. Through class visits, artistic presentations, and conversations, Reagon and her collaborators have brought forth possibilities for positive change. To mark the end of her fellowship, Reagon and her collaborators offer several events open to the public, so that all can participate in this forward-looking vision. Legendary archivist David B. Gracy once said, “You are what people think you keep.” In this workshop, archivist Chaitra Powell leads participants in unpacking that phrase and the process of creating archives. Before the event, participants should fill a shoebox or make a list of materials that represent their “archives” and bring it to the session. Together with Powell, they’ll go over why that material is important for the historical record, discuss best practices, and share ideas for activating that material to strengthen community. This workshop is designed for folks who find themselves enlisted as the keeper or custodian of their organization, family, or community memories. RSVP for this event. Chaitra Powell is the African American Collections and Outreach Archivist for the Southern Historical Collection at UNC-Chapel Hill. This event is part of The Alchemy of Change Festival hosted by activist, musician, and Carolina Performing Arts Mellon Foundation DisTIL fellow Toshi Reagon. RSVP for this event. Join Gina Breedlove for a Vibration of Grace™, your Voice and the Power of Sound soul service. Your Voice can be medicine for your body. The sound that you create can be a potent, powerful ally for you, your beloveds, and community. In our circle work we will move sound through our skin, organs, blood and being, from the soles of our feet to the top of our crown. As we practice ancient and new rituals of toning and intoning, we will discover where *stuck* energy may be lurking, holding, blocking our flow. Using the Sound of your Voice, you will develop mantras for personal intent, and receive practices for centering, presence, and releasing what no longer serves your life. This offering is for Black, Indigenous, POC, Women, Non-Binary, and Trans people 17 or older. Please note: there is an entry fee for this event. RSVP here. 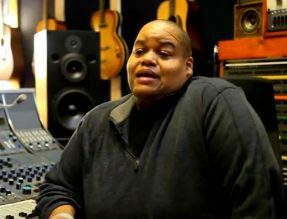 Before Toshi Reagon and BIGLovely take the stage at Memorial Hall, join Reagon and filmmaker Katina Parker for a screening of this new short film series. These beautiful short films serve as a call for us to recognize the often invisible work carried out by flesh-and-blood humans within institutions of learning. Accompanied by Reagon’s original music, the films feature intimate conversations with Reagon’s UNC student and faculty collaborators across multiple disciplines, uplifting passionate changemakers in our midst who are determined to change the course of our planet. RSVP for this event. 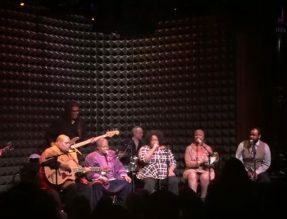 Join Toshi Reagon and BigLOVELY for a community song circle, featuring the many people with whom Toshi Reagon has collaborated in her time as a Carolina Performing Arts Mellon Foundation DisTIL fellow. This convening will feature music based on Act 1 of Octavia E. Butler’s Parable Of The Sower, as well as new original songs inspired by Reagon’s time in North Carolina. Each participant will address an environmental or social issue related to their expertise and research that is salient in the worlds of both Parable and the Triangle region today. RSVP for this event. Join us for the premiere of a short film series by Toshi Reagon, CPA Andrew W. Mellon Foundation DisTIL Fellow, and acclaimed filmmaker Katina Parker. Through intimate conversations with her UNC student and faculty collaborators, Reagon unveils the day-to-day work of these professionals from fields including public health and urban planning. The result is a showcase of necessary truths and the determination of these people to foster a better world, accompanied by Reagon’s original music. Reagon will also be joined by Parker and those featured in the films for a short discussion. Part of Toshi Reagon’s work as a CPA Mellon Foundation DisTIL Fellow, this series reveals the important, everyday work of people to foster a better world. Spanning fields from nursing to public health, urban planning, and more, the films feature UNC’s Linda Beeber, Courtney Woods, Danielle Purifoy, Danielle Spurlock, Todd BenDor, Sarah Long, and Mashallah Salaam. Toshi Reagon is a versatile singer, composer, musician, curator and producer with a profound ear for sonic Americana—from folk to funk, and blues to rock. She is the founder of WORD*ROCK*&SWORD, an annual community festival in New York City. With her mother Bernice Johnson Reagon, she has created three operas: The Temptation of St. Anthony; Zinnias, The Life of Clementine Hunter; and Octavia E. Butler’s Parable of the Sower, which had its US premiere at CPA in November 2017. Toshi is the recipient of numerous honors, including being named a National Women’s History Month honoree and a 2015 Art of Change Fellow by the Ford Foundation. She is the inaugural Andrew W. Mellon Foundation DisTIL Fellow for 2017-2019 at Carolina Performing Arts, and in 2018 was named one of four artists-in-residence under CPA’s newest Mellon-funded initiative, Creative Futures. Katina Parker is a filmmaker, photographer, journalist, and writer in Durham, North Carolina, who creates films and shoots photographs for Samsung, Al Jazeera, the Wall Street Journal, the New York Post, Fusion, and Huffington Post. Parker is a 2016–17 recipient of the North Carolina Arts Council Artist Fellowship and a former instructor at the Center for Documentary Studies. Join Spirit House, Inc. for its 5th Harm Free Zone Book Study of Octavia E. Butler’s Parable of the Sower. This book study will imagine what preparedness looks like in an ever-changing world. For details and location, click here. If you have any questions, email us at parablecityread@gmail.com. SpiritHouse is a Black women-led cultural organizing tribe with a rich legacy of using art, culture, and media to support the empowerment and transformation of communities most impacted by racism, poverty, gender inequity, criminalization and incarceration. We are Black, cash poor, disabled, queer, and formerly incarcerated, grassroots organizers, artists, alchemists, strategists and healers. We are multi-generational, valuing the genius of Black youth and the lived experience and wisdom of our elders. We prioritize the leadership of the people at the center of the issue who are most impacted by systemic racism and oppression. Singer-songwriter-guitarist Toshi Reagon is a celebration of all that’s progressive and uplifting in American music. Written by Toshi in collaboration with her mother—iconic singer, scholar and activist Bernice Johnson Reagon—this powerful theatrical concert brings together 200 years of African American song traditions to give life to Octavia E. Butler’s acclaimed science fiction novel, with revealing insights on gender, race and the future of human civilization. Studio Line: 612-529-5236--As a program of the Minneapolis Public Schools, we offer a hands-on educational program focused on broadcasting and production.